You may have seen them earlier this year when we pitted Pal against Pal in the fiercest battle this side of the internet, but the Leaderboards are back with a few new surprises. Accessible on the all-new Paltalk via the shiny new Leaderboards tab (left side of the screen), the My Region, My Pals, and Everyone Leaderboards each present a different set of perpetual live standings. They work off a seven-day running tally of your in-app activity and each category updates in near-real time so you can see who’s the boss whenever it strikes your fancy. Another of our favorite additions to Leaderboards is the ability to see your ranking on all boards regardless of number (previously, you could only see where you stand if you were in the top 50*). This allows you to measure your performance and track improvements, as well as providing a glimpse into what it takes to reach the very top. Remember, the Leaderboards only count your activity from the previous seven days, so if you can’t find your rankings, you probably haven’t been active in the past week. Try sending a gift or buying a credit pack to see where you land! In-app Leaderboards are currently available for desktop only, with mobile coming soon. You can also access the Leaderboards on the web, via a link in the Rooms tab on your desktop or by visiting paltalk.com/leaderboards from any connected device. You must log in to your web account to see your personal stats outside the app. Climb the ranks, get noticed, and take your place in Paltalk history. 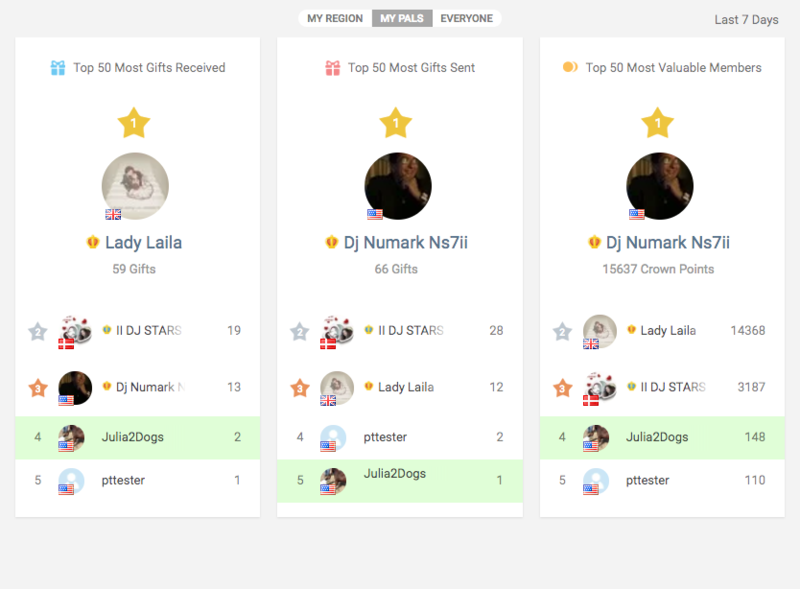 Log in to Paltalk today and check out the new Leaderboards! *Please Note: We display ties in the ranking as the same number, with 50 ranked members total, plus your personal stats if you fall outside the top 50. For example, if you see three #14 rankings, there are three people with the same stats for that board, and the next highest ranking is therefore #17.